Jason Kamras responds to questions about how to innovate public schools. 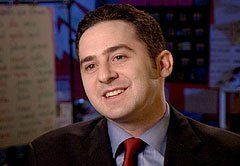 Edutopia.org published a two-part video interview with 2005 National Teacher of the Year Jason Kamras, who is now also a member of The George Lucas Educational Foundation's Advisory Board. At the same time, we solicited questions for Kamras from recipients of our Edutopia News e-newsletter. Not surprisingly, readers sent in some terrific topics for which Kamras provided thoughtful responses. What can be done to spread the innovative teaching you describe? There are so many teachers across the nation employing innovative strategies in their classrooms. I've had the great honor of seeing many of these educators in action this past year. I think we can all help spread these ideas by getting involved in the professional-development decisions of our schools, school districts, and states. Do your students continue their interest in and success with math in their high school years? I believe many of them do. Though I don't fully track all my students after they leave my school (I have about 150 students per year! ), I do keep in touch with many of them. One recently told me that when he began his freshman year in high school, the math department decided to place him in the tenth-grade math class because he had already mastered the objectives being taught in the ninth-grade class. That made my day! Can you share your lesson plans for math/photography and math using the map of Washington, DC? I use photography to teach many math concepts. For example, zooming a lens -- from a tight shot to a wide one, or vice versa -- is really just changing its angle of view. When we zoom the lens out, we may reach an angle of view of 150 degrees -- very wide. When we zoom it in, we may reach 20 degrees -- very tight. This is a great way to start a conversation about geometry, because the students can literally see the differences between the angles. I use the map of DC to teach coordinate geometry. The y-axis -- vertical axis -- is formed by North Capitol and South Capitol streets. The x-axis -- horizontal axis -- is formed by East Capitol Street and the National Mall, the area between the U.S. Capitol Building and the Lincoln Memorial. Quadrant I is northeast DC, quadrant II is northwest DC, quadrant III is southwest DC, and quadrant IV is southeast DC. The origin -- the intersection of the x-axis and the y-axis -- is the U.S. Capitol Building. Has the No Child Left Behind Act helped you do a better job of teaching? The NCLB has helped by setting very clear, very high achievement targets for all students. I think that's an incredibly positive step in American public education. Do you believe the rationale and goals behind the NCLB are realistic and obtainable? I do believe they're obtainable. Moreover, I believe we can't afford to not meet them. To get there, I believe we're going to need more Americans of the highest caliber to serve as educators and school leaders. Smart, talented, passionate adults of vision can produce high levels of student achievement even in the most challenging environments. I've seen this in my own classroom -- 90 percent of which qualifies for the free/reduced-lunch program -- and in countless others across the nation. We can do it! I teach college students who are going to become school teachers. They always ask me, "How do you stay positive? What do you do specifically, every day, to stay positive -- with parents who are often negative, students who are sometimes negative, and even colleagues who get down on students and the administration?" Here are three ways to stay positive. First, at the end of each day, have five students stand up and say something encouraging about one or more of their peers before your class is dismissed. You simply won't be able to leave without a huge smile on your face! Second, seek out colleagues and mentors who maintain a positive perspective themselves. Partner with them as soon as you can. Third, find time for yourself each and every week. I took a photography class every Wednesday evening my first year of teaching. I spent three hours every week mentally unwinding in the lab. I honestly believe that made me a better teacher and helped me maintain my positive outlook. Did you always plan to continue teaching after your two years with Teach for America? If so, what has kept you in the classroom? If not, what plans did you have for doing something other than teaching? When I started my Teach for America commitment, I wasn't sure whether I would remain in the classroom after my second year. In fact, I had always toyed with the idea of attending law school. But I very quickly fell in love with my school, my students, and teaching itself. So I set the law school applications aside. In retrospect, I think I would have been miserable as a lawyer! In your Edutopia.org interview, you say that when your students fell behind in math, your school doubled their math instructional time. As a former middle school teacher, I know this means that something had to be cut from their schedule. What did your school decide to cut to allow time for the double block of math, and what was your school's rationale for deeming what was cut as "not as important"? Many people ask this question. Let me first point out that we did not cut art or music. I'm a firm believer in the importance of the arts. Remember, I teach many math concepts through photography. We shortened our lunch period, and we cut about five minutes from the other periods. The faculty agreed that this collective approach was best. In working with colleagues, and in addressing educators outside of your own school, have you found a positive message that helps nudge the thinking of teachers who hold consistently low expectations for their students, especially for English-language learners and for children living in poverty? Great question. High expectations for all students is absolutely critical. Sadly, there are still too many educators who have not embraced this perspective. I think the best way to change thinking in this area is to highlight individual classes as well as entire schools that have beaten the odds by setting and maintaining high expectations. When you see a school just like yours, one that faces the same -- if not greater -- challenges, and the students are achieving, it's nearly impossible to deny the incredible power of setting the bar high. I'm on the local school board. What are the best ways to show teachers we really support them? We would love to pay them more, but we're limited in the money we can give based on taxes that are collected. More than money, I think teachers are looking for smart, sensible leadership. As a school board member, you can help provide that leadership. Spend time in school buildings so that you really understand what's happening in schools and classrooms. I'd even suggest you shadow a teacher for a full day. Then you'll be able to provide informed leadership to really support the teachers in your district.